UPDATE: This free pattern/project is no longer available. The designer has removed it due to abuse of usage. Check out this beauty! 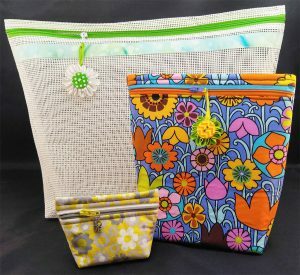 Joan Hawley of Lazy Girl Designs has very graciously given the gorgeous Noriko Bag pattern –FOR FREE– on her blog. If you’ve never tried Lazy Girl patterns, here’s your chance to do it FOR FREE! See for yourself why Joan has a HUGE and very loyal fan club. 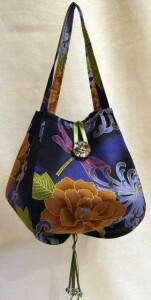 Click here to visit Joan’s blog post regarding the Noriko bag and scroll down the page until you find the pattern link. What a lovely gift this bag would make! You probably have everything you need to make it already in your stash. THANKS Joan! I’m so excited about the NEW Bosa Nova Bag pattern by Shelly Stokes for Cedar Canyon Textiles — of Shiva Paintstik fame. cover of the October Quilting Arts. Full color fold-out pattern has step-by-step photos and instructions for bags in 3 sizes as well as tips for making custom-size bags. The pattern uses LazyGirl HandyTabs to create a unique carrier for the bag’s ties. This is an exceptionally ingenious idea! Receiving a gift wrapped in a Bosa Nova Bag is like getting a double-gift. The beautiful bag can be re-used for years and keeps paper out of landfills. The Bosa Nova Bags pattern is available for order from SewThankful.com – click here to take a closer look. September is National Sewing Month! Celebrate by sewing up some fun with non-sewing or new-to-sewing friends. 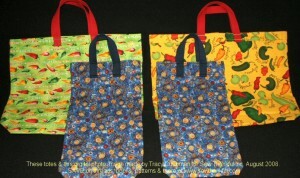 Joan Hawley of Lazy Girl Designs has issued a “Make 2 – Give 2” With Love Totes CHALLENGE to her Lazy Girl Yahoo Group. What’s a With Love Tote? The With Love Tote pattern is a a Lazy Girl Designs free pattern for a fast & fun 1 yard/1hour tote bag project. What’s this all about? You can read all about Joan’s Challenge and you can download a PDF file of the pattern by visiting Joan’s blog, click here (scroll down until you see the link). I am proud to say that I am a Lazy Girl and I’ve taken Joan’s challenge! Yesterday I made 4 bags–2 each two new friends (one is a beginner/occasional sew-er, the other does not sew). Want to see the bags I made? I used 1″ cotton webbing for the handles. I like the sturdiness of the cotton webbing and they helped the pattern go together even faster. I made 2 of the bags a different size than the pattern specifies. It was easy to change the size; just use the same technique. The blue bags are approximately 10″ wide by 21″ long. What could the long bags be used for? They are perfect for carrying a bottle of wine and a French Baguette and a couple other items. They would also be a great way to gift-wrap a long/tall box or package. This size would be a great size for Trick-or-Treating (long enough to prevent spills). They are light weight and sturdy! Just choose a Halloween Fabric and the kids will love them! I love these bags so much I need to make some for ME!! Perfect shopping bags (go green–carry your own). They fold up so nicely you can tuck them into your purse and/or glove compartment so you never have to “forget” again. Joan’s patterns are very easy to follow…just read and follow the instructions and you will have a bag you like and can truly use! This pattern was the same. I am very pleased with my results and enjoyed sewing the project. OH YEAH…it’s a great way to use up some of that stash that’s been building up! Whether you are a newbie sew-er or an old pro, you can join in the fun and inspire others to give sewing a try. 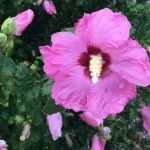 Check out Joan’s blog and consider taking her challenge. Click here. Great pattern, great idea Joan!!! Thank you sew much for sharing your talents.